Efficiency is our catch-all term for all of the decision support and management reporting functions of the system. Efficiency comprises these main elements. Costing Creates a ‘model’ of the process and utilises multiple cost families to build up the process including raw material, labour, chemicals, overheads etc. These cost families are combined to create overall costings for products. As individual component costs are modified, the updates permeate through all cost models to avoid the requirement of modifying each product individually. 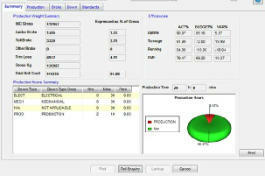 Dashboards Managers can have high-level customised views to display specific aspects of their areas of control. Any aspect on the dashboard can be selected to drill-down to a greater level of detail. These displays are constructed using exception reporting principles, automatically highlighting problem areas for further investigation. Production Reporting In our experience, this is area varies from client to client. Each has a different view of such things as yield and efficiency and how they are calculated/reported. We bring examples of different approaches and work with clients to arrive at the preferred solution. 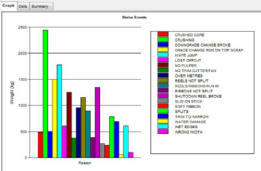 General Management Reporting ascman contains many standard reports and enquiries. Enquiries are generally prefaced by filters and the resultant display can be printed or sent to a spreadsheet.